Just thought I would share a photo of my oldest son, Matt, upon his graduation from combat medic training. 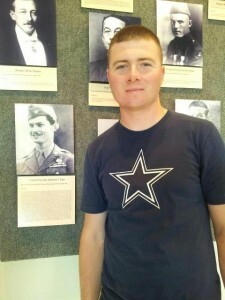 This photo was taken inside the Army Medic Museum located in Ft. Sam Houston, TX. Of course, the picture to the left is Desmond T. Doss, on a wall in the museum honoring medics who have received the Congressional Medal of Honor. Many of you know the story of Desmond Doss and why our school is named for him. If you do not know about this amazing man please see the tab here in our website under: About Us/History. There you will find links that can lead you to more info.